I woke up on day 2 of our Angkor Wat adventure feeling a hell of a lot better than I did the day before. Gone was the exhaustion and pain I experienced from walking for hours in extreme heat and humidity the day before. On this second day, I dressed much more sensibly allowing ample locations for the heat to escape and packing a few extra shirts for when the ones I was wearing were soaked with sweat. I went to bed early the prior evening foregoing dinner, foregoing a relaxing swim in the pool, foregoing everything but a shower and a cold bottle of water. My body needed rest. The little death of sleep worked it’s magic and healed my aching body preparing it for another day of exploration. We rose before dawn for this was the day we planned to watch the orange sun kiss the towers of the great temple. There are two options. One is to be inside the temple complex but that would likely be crazy crowded so we opted to sit outside the temple on the wall just outside the river. It would be a great place to catch reflections of both sky and temple. Hundreds of others had the same sunrise plans as us. We were there earlier than most so were able to pick a good location on the wall to sit and watch. Unfortunately, the day was mostly overcast as would be all our days in Cambodia. Other than a brief peak of the sun through a narrow opening in the clouds, the sunrise was less than spectacular. The heat and humidity did make a showing and were our companions for the entire day (and night). 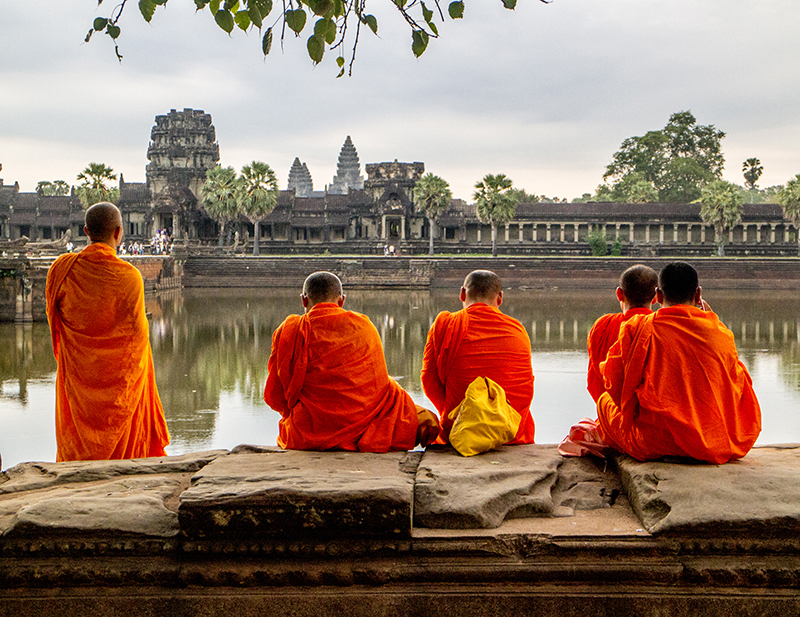 The highlight of the morning was capturing pictures of a set of five, orange robed monks with Angkor Wat in the background. I don’t know if they were visiting monks on a pilgrimage or local monks making daily homage before going out to collect offerings from the devout. Either way, they added a punch of color to the scene and my photographs. I was careful to remain out of their way in the event they were there for spiritual reasons. There was one photographer who walked in directly in front of them and took a bunch of photos of their faces from just a few feet away. He was literally in their faces. I was horrified. Stop number two this morning was Banteay Srei, is a 10th-century temple dedicated to the Hindu god Shiva. I was very surprised that the Angkor Wat complex contained a mixture of Buddhist and Hindu temples. I later found out that Angkor Wat itself was originally constructed as a Hindu temple that was gradually transformed into a Buddhist temple. Banteay Srei is near the far Northern end of the Angkor Wat temple complex. Getting there in our tuk tuk took a good 45 minutes. It was a great ride through tall trees and little villages. In the villages, we luxuriated in the smells of local food being cooked. We also caught glimpses of every day life of the local inhabitants. We arrived at Banteay Srei around 7am. At that early hour, we had the place pretty much to ourselves. The vendors were not yet open for business but that didn’t stop two of the early arriving vendors from attempting to lure us into their shops. We wanted to ensure we were able to see the temple devoid of the masses so we let them know we would come back after our explorations. Banteay Srei has a different color than the other temples we visited. It is built primarily of red sandstone, a soft medium that lends itself to elaborate carvings. It was host to some of the most intricate carvings we experienced during our trip to Cambodia. Deep in the heart of the temple, the most intricate of the carvings was roped off from the visitors with guards posted to ensure the line was not violated. Well, that’s the implied reason for the roped off area. I was taking pictures with a zoom lens near the line of demarcation when one of the guards came up to me, raised the rope, and asked if I wanted the VIP tour. This type of offer, translated, means give me a monetary gift and I will bend the rules for you. Calling the person a VIP is meant to flatter them into accepting the offer. I inquired as to the size of the offering requested. It was a mere five US dollars which I gladly paid. It allowed me to switch to a prime lens enabling me to capture sharper pictures. Some of those intricate carvings can been seen in the pictures below. Of the carvings, local readings said the style indicated they were most likely carved by women. Whether they were carved by male or female, they were simply amazing. True to our word, we returned to the vendor area to purchase some of their wares. Actually, my wife was the primary purchasing agent. I sat and enjoyed a bowl of the local vegetable soup while she negotiated. At every tourist stop no matter how prominent the site, there are locals selling wares. Those with structures set up tend to charge more than those walking around holding an armful of goods. In either case, the original price for the item is a starting point for negotiations. We counter offer with 1/2 the price and end up somewhere in the middle. We are happy getting a good deal and the locals make some much needed money to support their families. The difference with the two types of vendors is the starting point which tends to be higher with those selling from structures. My wife was able to purchase a few pair of very pretty pants decorated with elephants and other patterns. The final price was generally $3 USD. I had purchased a similar type of pants for her online as a Christmas gift for close to $20 USD. She definitely got the better deal. The final day was a partial rehash of Day #1 because I had suffered from a case of heat exhaustion and was not able to enjoy the temples as I had hoped. Visiting them through a haze of heat, extreme fatigue, and physical pain meant I was not able to dwell in their beauty. I think my favorite temple of all was Ta Prohm. I was mesmerized by the massive tree roots colonizing most every temple. Some tree roots seemed to sprout out of the tops of the temple while other tree roots seemed to be eating the temples. I loved how the consecutive doorways from the exterior to the interior where the royalty took visitors were increasingly shorter from top to bottom so the visitors had to crouch down. The initial door was typically guarded by large, carved sentries. The final doorway into the royal sanctuary was so short that the entrant was forced into a bowing position when finally getting to visit the king or queen. 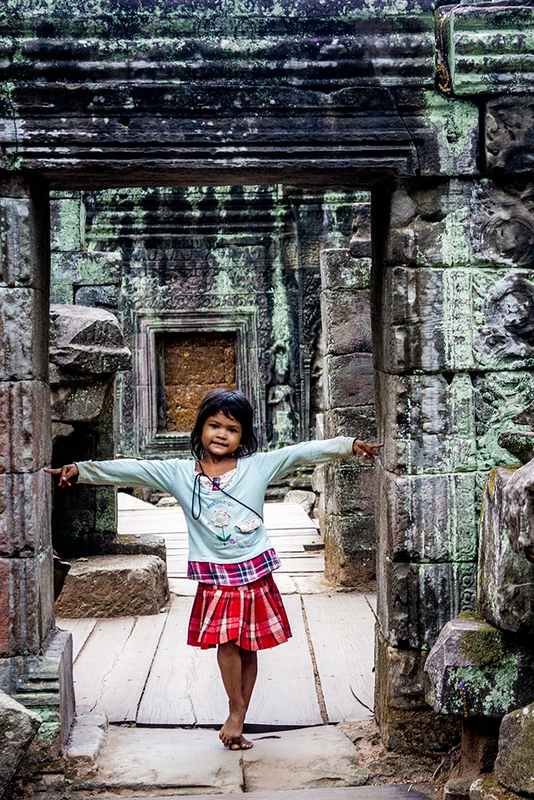 While exploring the maze of corridors making up Ta Prohm we were greeted by a young girl. She wanted us to buy some of her bracelets. I pointed to my camera then at her and she ran to an archway and posed for a picture. I loved her head tilted pose, the single finger touching each side of the archway, and how her sweater color mimicked the color of the walls. I dubbed her the Cambodian Angel for her angelic presence. In thanks for the picture, we agreed to purchase one of her bracelets. We followed her to her box of goods and picked one. Suddenly, her quoted price doubled. We offered her the original price which she accepted with a winning, heart warming smile. Our last stop was the same as our first stop – the massive Angkor Wat temple. We came in through the back entrance instead of the front. This was at our driver Tom’s suggestion. The backside was very quiet and full of trees….very different from the touristy front entrance. We were able to walk around parts of the temple as the only tourists in the area. It was serene. We wandered in an around the massive stone walls and rooms again enjoying the beautiful motif, the carvings, the exquisite brick structure. For a brief while, we sat enjoying the design of what used to be a room with a great pool and wishing it was filled with water so we could jump in and get momentary relief from the oppressive heat. We visited the vendor stalls and picked up a few more souvenirs, indulged in bottles of cold beverages before taking our final walk on the elevated walkway connecting the inner sanctum with the main entrance. Angkor Wat Former Pool Room? Angkor Wat is definitely a must see for the many unique temples all within a close distance of each other. It’s also a must see for the friendly people and the excellent food. The tradeoff that must be made is to visit in the oppressive heat of the summer when the tourist count is relatively low or to visit in the relative cool of winter with oppressive hoards of tourists. Given a choice, I would most likely come back in the summer when tourist numbers are low. The sights are just as important as being able to enjoy them with a level of tranquility that is difficult to achieve when the masses flock. 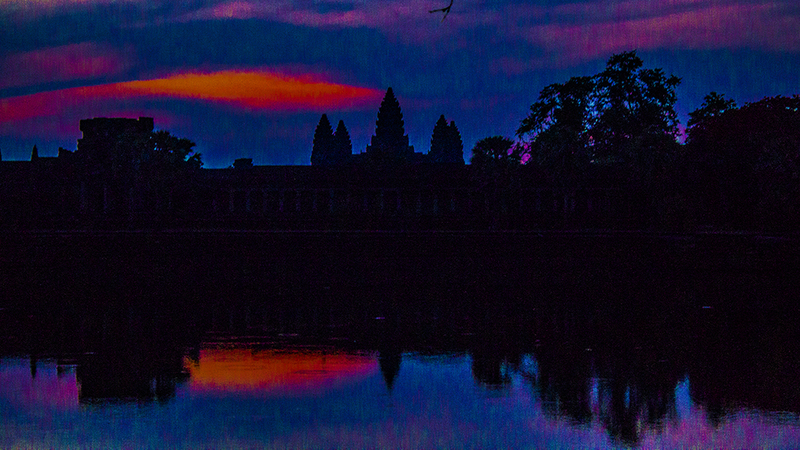 This entry was posted in Cambodia, Exploration, Travel and tagged Angkor Wat, Temples. Bookmark the permalink.